The public will get a chance to weigh in on tougher state rules for siting fish farms pushed by a group of activist landowners and lobster fishermen. Organizers submitted a petition with 189 signatures to the Department of Marine Resources last month to put an immediate moratorium on aquaculture leases bigger than 10 acres and create a new rule that would make state regulators consider alternate locations before approving aquaculture leases. Petitioners got almost 40 more signatures than necessary to trigger a state rulemaking process. Marine Resources Commissioner Patrick Keliher, in an April 10 letter to group spokeswoman Crystal Canney, said the department intends to hold a public hearing on the proposed regulations before June 1. Demand for changes to aquaculture rules partially stems from an application from Mere Point Oyster Co. to build a 40-acre oyster farm on Maquoit Bay, in Brunswick. The proposal has been criticized by local landowners worried about the noise, smell and visual impact, and commercial fishermen worried it will impede access to lobster fishing waters. Mere Point Oyster Co. has argued that its aquaculture site was chosen so it would not interfere with commercial fishing and its owners say they are going to split their area up so boats can travel through. A company spokesman did not respond to an interview request Tuesday. Department of Marine Resources staff held a multi-day public hearing on the company’s application this winter. The application is pending at the department. The Brunswick proposal is the flashpoint in bubbling concerns about Maine’s fast-growing aquaculture industry. In the past five years, Maine has approved nine aquaculture leases a year on average – compared to an average of seven leases a year approved between 2009 and 2013, according to the department. 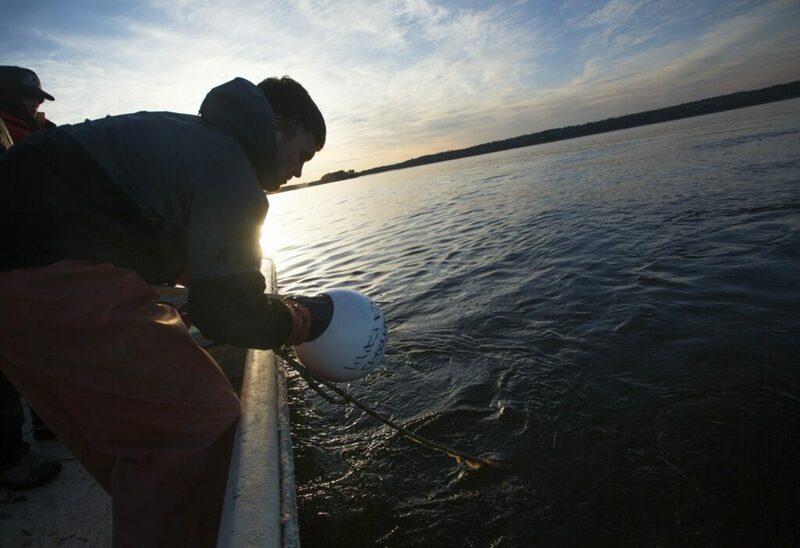 In some communities, the rapid growth of large shellfish farms has sparked opposition from nearby landowners and others. The state’s current aquaculture evaluation process includes making sure a new lease will not unreasonably interfere with navigation, waterfront access, fishing or other uses of the area, result in unreasonable noise or interfere with wildlife and marine habitat.